I’ve heard uttered before a CrossFit workout at Uncanny that “the workout isn’t worth doing unless it’s performed Rx.” Upon hearing this statement, two things ran through my mind: 1.) wait, did someone really just say that? 2.) they obviously don’t understand why and how they should probably scale this workout. After cringing a bit, I had to walk away from that conversation, and thankfully a coach was there to interject the fundamental wisdom that was seriously amiss by that statement. Athlete performs kettlebell presses as a modification for handstand push-ups during a class workout. Something about those overheard words has never really gone away from me. In fact, hearing them has even reinforced what I know to be true about CrossFit programming – it’s infinitely scalable. One of the things that made me fall in love with CrossFit was the idea that anyone and everyone can participate in a workout. From the 80-year-old who is just trying to beat the odds of their life expectancy, to the 20-year-old college basketball player trying to stay in shape for the upcoming season, this fitness methodology is designed to apply to everyone. What brings this spectrum of people together is that they all want to be better, fitter, and healthier versions of themselves. But, the functional needs, limitations, and fitness capabilities of an 80-year-old will differ significantly from that of a 20-year-old. So, when these two levels of athletes perform a workout, chances are the movement patterns in that workout are going to look different for each athlete, but one thing should remain the same: the intended stimulus of the workout. 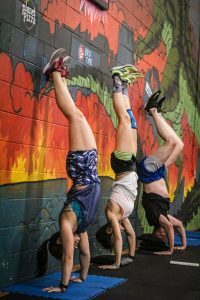 CrossFit explains that the importance of scaling a workout is to “preserve the intended stimuli despite athlete limitations, such as experience, injury, illness or range of motion.” This idea is extremely significant, and it has taken me a few years to fully realize and see the benefits of scaling. When I first started CrossFit, I had full confidence in my fitness capabilities. With a background mostly in competitive cross country, track, and swimming since I was eight, the idea of a 10-15 minute workout didn’t intimidate me at all. Then, during my very first, post-foundations, CrossFit class I met “Helen,” and was quickly served a big ol’ piece of humble pie. Setting up my equipment, I ran the workout through my head and how I was going to attack it. In my head: running – no problem, that’s my jam. Kettlebell swings – that’s a moderate weight for me, should be fine. Pull-ups – I’m not great at these, but I can just struggle through. I should be able to finish the WOD as Rx in about 12-13 minutes. Here’s what happened. Running – went fine for the first round, and then didn’t because I was so dead and frustrated from struggling through the pull-ups each previous round. 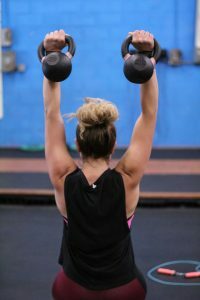 Kettlebell swings – the weight got too heavy for me in the second round, and I had to break the swings into small sets, like threes and fours. Pull-ups – to say these went poorly would be an understatement. 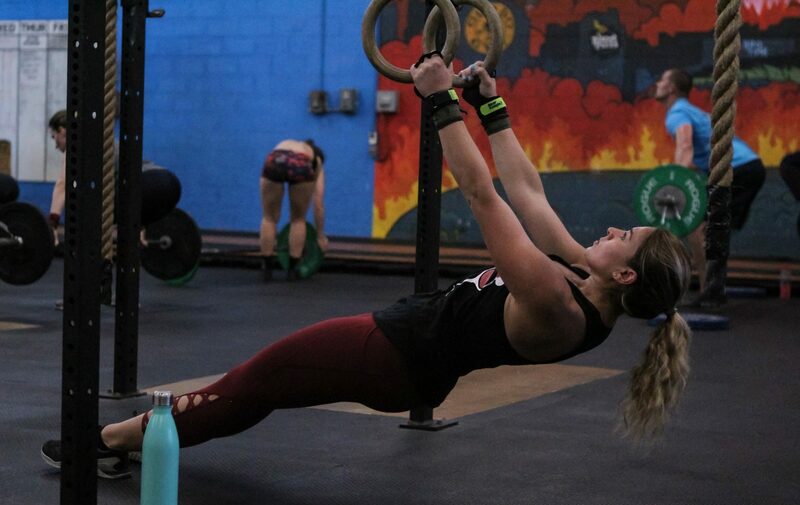 As I was struggling to kip my chin over the bar for singles in the first round, my coach came up to me, strapped a band on the bar and said, “put your foot through this loop and don’t kip, strict pulls only up to the bar.” I didn’t argue, just said “okay,” held back my tears and continued to struggle with a band, my forearms burning from the kettlebell swings. By the end of it all, I finished Helen, scaled, in 15+ minutes. All I could think about were the other athletes in the class who were so easily able to beautifully butterfly their pull-ups, unbroken, for 12 reps, each round. What made me come back the next day, and every day since was the determination to improve not only my pull-ups but the numerous other movements that I couldn’t do Rx (yet) in a workout – which were a lot. Every workout I was finding something that I was not good at, which was new (and frustrating) to me considering I’d usually been decent at nearly every sport I’ve tried. I was scaling workouts almost every day for the first few years of doing CrossFit, and I still scale workouts. Why? Because my strength, range of motion, and skill level needed to perform the workout as Rx at the intended stimuli were not there yet. Using ab mats is an option for scaling handstand push-ups when they come up in a workout. The coach that stopped me during that first workout forced me to check my ego, and that was probably one of the best things that ever happened to me. I was forced to take a hard look at my weaknesses, accept them, and find a way to get better. Since then, I’ve tried to take my weaknesses (i.e., pull-ups, double unders, ring dips, snatches, toes-to-bar, pistols, etc.) and improve upon them at every chance I get. I’d especially like to point out that I do not admit being an expert or “the best” at any particular movement, but I am proud to say that I’ve been able to grow as an athlete because of the realization I had with myself about where I was in my fitness journey. If there is one thing CrossFit has taught me it is to be humble, put your head down, and do the work because there is always something to get better at. Scaling Helen, and many workouts after that, forced me to slow down, assess my abilities, and listen to my body. It took me a long time to admit that fact, but I’m glad that I have because after four years of doing CrossFit I’m finally starting to see the results of taking the time to put in the extra work. Was it frustrating to see other athletes write their score with the coveted red “Rx” marker on the whiteboard, while I had to put mine in the green “scaled” marker? Sure. But, it made me respect those athletes for the work that they put in to consistently improve their mechanics to achieve the prescribed intensity of a workout. And, it made me realize that putting an Rx score on the board every day just to say “hey, I did it Rx” wasn’t going to help me become a stronger and more efficient athlete in the long-run. As athletes, we all want to progress to achieve our own fitness goals, but it takes time, practice and discipline to get there. We all have to start somewhere, and there’s a difference between challenging yourself in a workout and suffering for the sake of getting a few reps as Rx on the whiteboard. The risk usually outweighs the reward in those situations. Taking the time to ask a coach how to modify a workout’s movements so that you can still achieve the programmed intention of the workout is always the best option when you’re not sure if you can do a workout as Rx. You’ll be no lesser of an athlete for admitting you may need to back the weight down, scale the reps, or modify a movement. You’ll still get just as good of a workout as the guy next to you who chose to do Rx; and, you can continue to build the skills you need to achieve those Rx movements later. “As Rx” is a standard, yes, but it isn’t the end-all, be-all, of what an athlete is meant to achieve in any given workout. My point here is, that if you know what your strengths and weaknesses are, use them and work at them to your benefit. Your Rx may not be the same as say CrossFit Games Champ Mat Fraser’s Rx, but you can both achieve the same stimulus when performing the same workout, the movements and rep scheme may just look different to obtain that result. To learn more about scaling and for a great breakdown of alternative movements to substitute when modifying a workout, check out Jeremy Gordon’s article in The CrossFit Journal, “Scaling CrossFit Workouts.” It’s geared towards coaches but can benefit anyone looking to improve their skills and achieve the same stimuli as Rx athletes when performing a workout.